I stopped drink soda pop years ago because of the artificial ingredients and vast amounts of sugar. When I first saw the Sodastream demonstrated I thought that it was a very unique concept but I wasn’t really sure if it would get any use in my home. I was wrong…..very wrong! 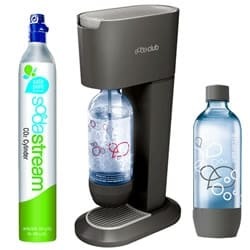 Sodastream has so many benefits over store bought soda pop that I was excited to write this review and introduce it to the Simply Stacie readers. Sodastream allows you to make your own soda, sparkling water and carbonated water in your own home using water. This is so attractive to me because I can control the ingredients and select only the products that appeal to my family. I was buying plain carbonated water at the grocery store…sometimes 4 liters per week. I was appalled to imagine the amount of plastic waste I was using and not to mention the exorbitant price. With Sodastream, I can make my own carbonated water and it is even more delicious since I use my own filtered water and it is “made to order.” My husband enjoys soda pop as a treat on occasion and really likes the naturally flavored Sodastream flavors including Apple Mango, Pink Grapefruit, Lemon Lime and Orange Pineapple. When my husband originally saw the Sodastream box he rolled his eyes and declared it a “spacer taker.” I ignored him and proceeded to make my first bottle of soda in less than 30 seconds…it was SO simple. Just fill the bottle to the marked line, screw it onto the Sodastream machine, press the button three times to add carbonation and voila….a tasty bottle of soda or carbonated water. Out of the corner of my eye, I noticed my husband watching carefully, his interest peaked. He asked for a sample and declared it “delicious”. He decided he wanted to try it out himself and in all honesty he turned out to be Sodastream’s “biggest fan”. It is funny to see this former skeptic telling everyone about his discovery and offering to give demonstrations to all of our guests. He conceded that Sodastream actually takes less space in our kitchen than several two liters of carbonated water. We both liked the sleek design and simplicity of use. It is certainly not gathering dust and I dare say the poor machine gets a daily workout from the Ruble family. Another bonus is that the bottles are BPA free and are good for up to two years of use. Being BPA free is a huge bonus in my opinion as I am typically skeptical of reusing plastic bottles for my families use. Sodastream is also an amazing value because it costs on average only 25 cents per can of soda or 25 cents per liter of carbonated water. If you consider how many bottles of soda are thrown out when flat, this is also a money saver. There are four Sodastream soda makers to choose from and I recommend the Fountain Jet. You can decide which Sodastream soda maker would be best for your family by using the “Which Soda Maker is right for me?” feature. Sodastream soda makers start at a very affordable $79.95 for the Fountain Jet and range to $199.95 for the new Penguin. 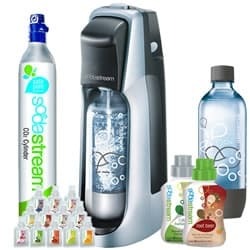 You can purchase Sodastream soda makers, extra carbonators, Sodamix and bottles and accessories. Not a big soda drinker? Don’t worry because Sodastream offers energy drinks, water flavor essence, diet drinks, iced tea, tonics and sparkling naturals. You can view the entire selection on their site. Sodastream would make a great gift idea for the holidays or as a hostess thank you present. Don’t forget wedding and housewarming gifts too…..
To purchase Sodastream or to locate a store near you that has Sodastream products. I want to try the Ginger Ale!